when it happened. I dipped my finger into my culinary concoction and Oh. My. Goodness. I did a little dance and declared aloud, Wow. Wooowwwww! Last time this happened I was in DC, making butterscotch from scratch for the first time. This time, the setting was a bit different (I was in Jess’s kitchen in Boston). And the concoction was different too. But my reaction and pure glee upon the discovery of something AMAZING was the same. Yuuuuummmmm! So is the suspense killing you yet? Just what was this amazingness? Well, the project was Whoopie Pies with Coconut Pecan Filling. 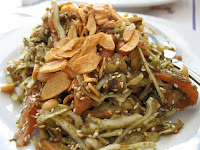 And the particular component in question was the Coconut Walnut Filling. DAMN. That is the best thing I have ever dipped an apple slice into! Carmely and coconutty and walnutty and fabulous. And the whoopie pies were good too! The cake part is chocolatey and not too sweet, so it pairs well with the decadent filling. Normally a whoopie pie is made like a sandwich cookie, but mine puffed up so much that I decided to just cut them in half and fill the insides. I had never heard of whoopie pies until I made their acquaintance in the West Campus Dining Hall freshman year. They are cookie-shaped cakey domes, sandwhiching some sort of frosting filling. Traditionally they are made with chocolate cake and vanilla filling, but like any cake, the filling/cake possibilities are endless! I think I could really get into these little babies. They’re a lot like a cupcake, but more portable. They store well, and you don’t have to worry about the frosting getting messed up in transportation. I made mine miniature, but you can make them as big as you like. And make extra filling. Trust me, you will definitely want it. Heat oven to 350°. Grease a large baking sheet or 6-cup muffin top pan. 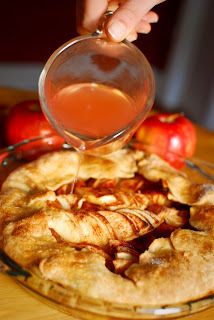 In a large mixer bowl with electric mixer, cream butter with sugar until smooth and creamy. Beat in the egg and vanilla. Add about 1/3 of the dry mixture to the creamed mixture, along with half of the buttermilk. Beat until blended. Add another 1/3 of the flour mixture to the batter, along with the remaining buttermilk. Beat until blended. Blend in the remaining 1/3 of the flour mixture until batter is smooth. Drop batter on the prepared baking sheet or muffin top pan, about 1/4-cup at a time, leaving about 2 inches between the mounds. You should be able to bake 6 at a time. Bake for about 14 to 16 minutes, until the cakes spring back when lightly touched. 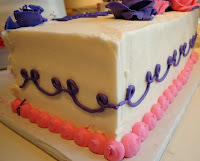 Transfer cakes to a rack to cool completely. In a medium saucepan over medium heat, combine the evaporated milk, sugars, butter, and vanilla. Bring the mixture to a full boil, stirring constantly. Remove from heat. Quickly whisk a small amount of the hot liquid (about 1/3 to 1/2 cup) into the beaten yolks. Return yolk mixture to the hot mixture in the saucepan and blend well. Return to the heat and bring to a boil, stirring constantly. Lower heat to medium-low and boil gently, stirring constantly, for 1 minute. Remove from heat and stir in the coconut and pecans. Cool until the mixture reaches spreading consistency, stirring frequently. When the filling is thick and spreadable, spread a generous amount on the bottom (flat side) of a cake. Place another cake on the first one to make a whoopie pie. Makes about 12 large whoopie pies. We did it again. And it was glorious! Since that moment of staggering genius, we have now had 4 dessert parties. Four times we have exchanged countless emails planning our desserts. Four times we have gone into near-hysterics in excitement the night before. Four times we have donned our spandex in anticipation of the dessert food-baby to come. Four times we have loaded plate after plate with a variety of such sweet goodness seldom seen in one location. And four times we have laid on the floor, sugar-coma’ed to the max. 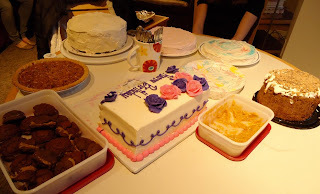 The first Dessert Party was for Erin (of the Cake Flavoring Oil) and Ellie's (of my beautiful blog banner) 21st birthday. 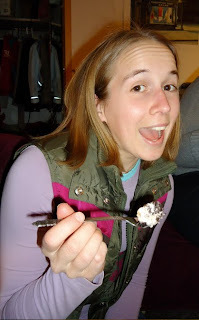 Some people drink…we eat cake. Then I hosted one to celebrate my graduation. 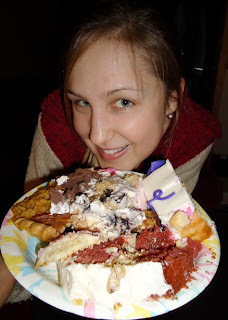 You may remember, back in October, I trekked to Boston for the sole purpose of eating absurd quantities of cake in honor of Jess’s birthday. And finally, as the year comes full-circle, I again traveled to Boston for Erin and Ellie’s birthday. Each Dessert Party has been unique (we don’t waste time with repeats)...and all have been awesome. 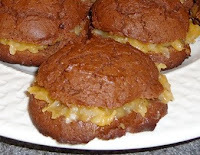 This time, I made German Chocolate Whoopie Pies (more on that tomorrow). Erin bought a cake from Sweet Cupcakes, and made a Sugar Cookie Cake. As we lolled around the apartment, declaring that we couldn’t possibly fit in another bite…in walked a gorgeous orange cheesecake. OMG. I waited almost a half-hour…then went for it. I mean, how could I resist something so beautiful? And it was totally worth the border-line sugar-sickness. Mmmmmmmm. Not that I usually advocate for gluttony…but we do work out a lot…and well, sometimes you just have to do it. 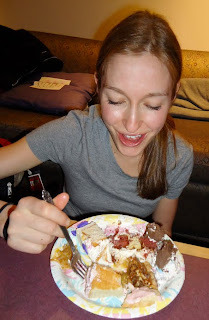 As I’ve explained before: Dessert Party = no limits and no judgement! Yum! I apologize for the absence of a Literary Bite last week. I blame it on my houseguests – and the fact that some books just take more than one week to read. This is the type of book that you study. 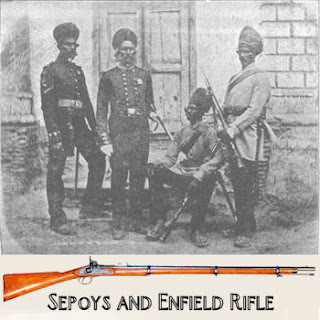 You can enjoyed The Siege of Krishnapur for its surface value as a story of a British outpost in the “Queen’s India,” but there is much more to it than that. I’m sure that countless essays have been written about this book and its commentary on Victorian England, colonialism, feminism, race relations, etc. But I am no longer in the analytical-essay-writing phase of my life, and I certainly won’t subject you to a treatise on Farrell’s social commentary and use of irony. Let’s just say that overall I like the book. 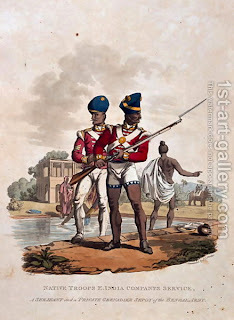 It’s very similar to Burmese Days by Goerge Orwell – tea-sipping, jolly good old British in India maintaining their social graces in the face of an attacked by the natives, heat, disease and death. The book is an ironic social commentary, but the characters are very well-developed as individuals. I didn't expect to like it, but I did! So I will recommend this book, but with some reservations. It does drag in parts. Sometimes Farrell gets sidetracked from the story and goes off on seemingly irrelevant tangents. And because I cannot really picture the scene of the siege, the long descriptions of the battle can become tedious. But it is recognized as an exemplary piece of literature. 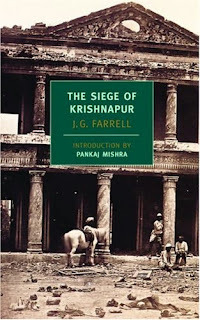 The Siege of Krishnapur won the Booker Prize for Fiction in 1973, and was recognized again in 2008 (along with 5 other books) in the Best of the Booker Awards. Also, I do not usually read the introductions to books, but for some reason this time I did. The introduction, by Pankaj Mishra, is very well-written and gives political, literary, and social context to the book. But spoiler alert! The introduction gives away the ending! Not that the book is a mystery or anything…I was just surprised to know before I started how it would end. So I suggest you read the introduction at some point. When depends on your priorities. If you want to understand the context and literary value of the story, read it first. If you would rather form your own opinions and then see what someone else has to say when you’re through, read the Introduction at the end. And if you find yourself in the middle of the book, cursing EatRunRead for recommending such an odd piece of literature, 1) remember that you love me and I would never steer you wrong, and 2) read the Introduction before you continue with the book. Mollie, when we come, will you make us a pie? Asked Sister2 last week. My initial response: Ugh. NOOOOOO. Uh-uh. No way. Not happening. I don’t do crust. I trace the source of my crust–aversion to my mama. 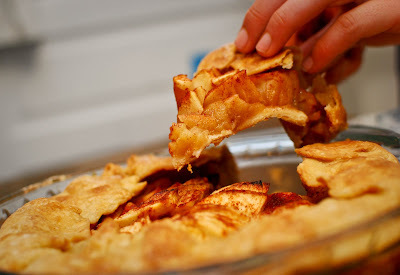 Most of the time, her pie crusts came out flaky and beautiful. But on some cursed days, the crust just wouldn’t work. I can picture my mama in the kitchen, trying to coax her crust into behaving. Come on! Please! Don’t crack! Don’t crack! Oh no! No no no no!!! The ball of dough made a trajectory to the trash, and mama started all over again. So you can see why in my mind crust = ugh. But Sister2’s boyfriend, like so many boys, doesn’t like cake. (I know, what is that about? Right???) But it’s true. 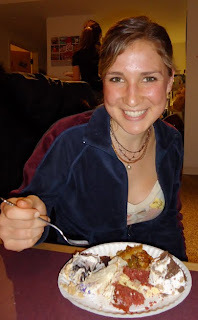 In my experience men prefer pie. And after my initial no way reaction, I reconsidered. 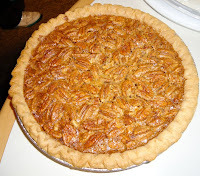 A whole pie was just too daunting. But a tart? For some reason that seemed easier. Just one crust, and it’s meant to look rustic. 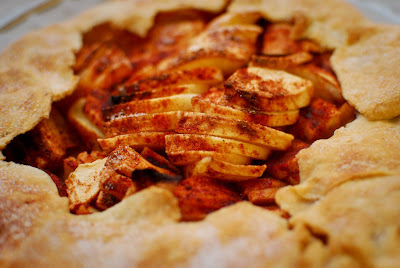 So I got my Google on, and found Smitten Kitchen’s Simplest Apple Tart. 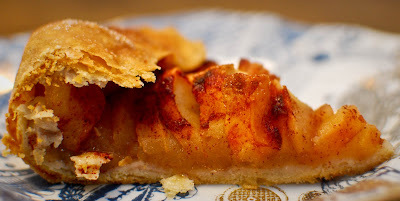 I don’t have a tart pan, so this is a tart in pie form…a “part,” if you will. I psyched myself up, and dove in. Bring on the crust! 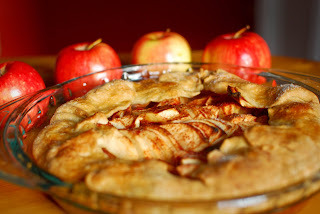 OVERLAP apples on dough in a ring 2 inches from edge if going galette-style, or up to the sides if using the tart pan. Continue inward until you reach the center. Fold any dough hanging over pan back onto itself; crimp edges at 1-inch intervals. I sprinkled the apples with cinnamon. 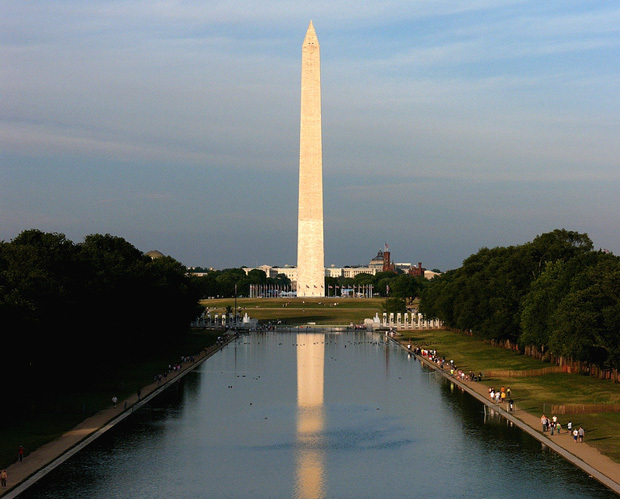 As you may know, Sister2 ran the DC National Marathon this weekend. 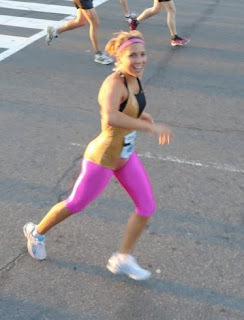 What you may not know is that she did so in neon spandex and a gold unitard. Were you out watching? Did you see that girl? Did you cheer for her? Or call out some version of “Love your outfit! Nice spandex! Great uni!”? Well, I was the more normal one next to her. And proud of it! Why the costume? Isn’t a normal running outfit enough, you may wonder? Well, she ran Boston last year in a greeny-yellow unitard…so she might as well uphold that tradition…and if you’re flying cross-country to run a race, you may as well do it right, right? Oh my gosh what am I going to wear? She wondered the night pre-marathon. She stood in my living room, alternating between two equally ridiculous outfits, trying to make her decision. Ugh! This is like the most preparation I’ve done for this race! That statement is obviously not true. Because despite her absurd apparel, this girl can run (you already know the story of how she started marathoning). She’s only 20, and yet she has now completed 2 marathons in under 4 hours! So don’t let the uni fool you…as many DC men discovered early Saturday morning: Once the uni passes, it’s gone for good! And I’m going to go ahead and take just a teeny tiny little bit of credit for her awesome finish. I did help! I swear! My friends and I were out there cheering at Mile 3, and when she passed us again at Mile 17, I jumped in to keep her spirits up through the last 9.2. I tried to make myself useful. I “amused” her with chatting and useless information. Ok, Sis2, I’ll just stop at this med station real quick, grab you some Vaseline, and catch up. No problem! So I stopped, and put on my best lost-and-desperate face…and…nothing. There was no one at the medical station! What??? Seriously, what if I had been a dying marathoner??? I stood there for a moment, wondering what to do…I saw the big box of medical supplies…looked around one more time to see if anyone would come help me…and then started digging through their stuff. Vaseline – jackpot! I scooped out a chunk onto my finger, and jumped back in the race. But enough time had gone by for Sister2 to get way ahead of me. Her pink spandex was just a glow in the distance. Oh man, time to run! I started striding after her, doubtlessly impressing those who had already run 23 miles with this sudden burst of mid-marathon energy. So there I was, dashing after Sister2, as she passed me on the “back” part of the out-and-back. She gave me this look, and waved me over. It’s not like I was actually in the race…I could have just turned there and joined her. I can’t! I can’t cheat! Don’t slow down, I’ll catch up! I yelled at her. Because no one around me knew I wasn’t really in the race. And just think how pissed you would be if you saw someone cutting corners like that! Eventually I caught up…and pretty much saved her life with Vaseline. So yeah, that’s my story. I didn't plan on crossing the finish line. I saw the barriers lining the course about 200 yards before the finish, and prepared to duck out. Ok, I’ll meet you at the end! I said. But then I saw that poor Sister2 was not looking good. She was gagging…I was concerned…so I stayed with her through the finish. All bow down to the super-speedster in the crazy outfit!!! After the race, we took full advantage of the free stuff (bars, mochas, cookies? yes please!) at the post-marathon festival. Then we ate our weight in brunch buffet, and went to the zoo. I’m proud to be her sister! Wouldn’t you be? Wooooosaaaahhhh. The beauty of blogging today is that I get to take a moment and think about running alongside thousands of others in 2 days...that I will soon get an opportunity and a day to try something new. It definitely makes me feel *warm fuzzies* inside to remember the slow yet wonderful ascent of my training. I am in constant awe of how the human body functions and adapts to everything that you put it through! My work life has taken over a much larger part of my mental and emotional spheres in the past few months, and that has increased my stress levels tremendously. But as my friend says, running is great because for those minutes that you're out on a run, you don't have to think about anything else but your running. You cannot beat yourself up over not doing anything else because you're running, and in that moment---that's all you can ask of yourself. As much as this experience has been a self-challenge, it's also been my foxhole to hide out in when the going has been rough. 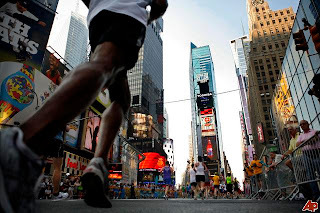 This Sunday, I’m running the NY Half Marathon! 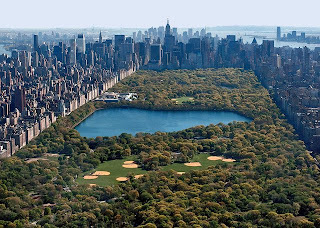 It's going to be a beautiful course: start in Central Park surrounded by the beginnings of spring…run through Times Square without the throngs of tourists and just take in the sights from a different view…and then soar down the West Side Highway with views of the Hudson all along the way to the Financial District. Afterwards my fellow-racer and I plan to completely let ourselves go at La Palapa, a gorgeous Mexican restaurant, with a bunch of friends! And then later reward ourselves with some amazing desserts at Momofuku Milk Bar. Everyone keeps asking me if I'm nervous. All I can say is: no way! I've stuck with the running plans that my AWESOME COACH-FROM-AFAR (Editor's note: aww, isn't she sweet???) has given me. I've got my outfit (Nikes, lime green shorts, depending on how cold it is in the a.m.---a black short sleeve or grey long sleeve, and my black baseball cap) and my pre-runs and meals planned. Along the way I've learned about my body, about the sport and even ran in a few small races leading up to this weekend. I'm not out to set a record or win it, but I'm there to finish and to finish strong. I'm there to enjoy the experience to its fullest and just have fun! All I feel is ready and excited. I can't wait to just get out there.